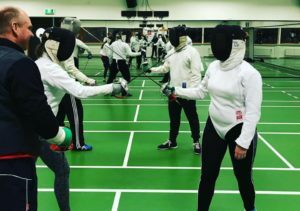 Our workshop is the perfect opportunity to get to know fencing and have a good time with a group of friends or colleagues. In two hours you together will learn the basics of one weapon. At the end of the workshop, you can try to use your newly learned skills in a small competition. Are you the fencer of the day? Due to the amount of material needed, unfortunately it’s not possible for us to give workshops on a different location.